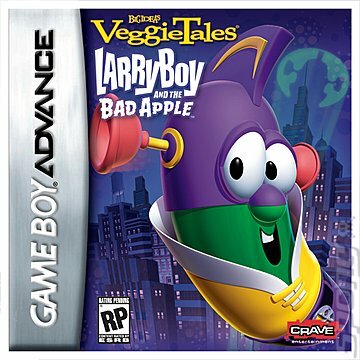 In VeggieTales: LarryBoy and the Bad Apple for Game Boy Advance, you play the role of LarryBoy who is trying to help rescue other \’people\’ from their temptations. For example, in one mission Junior Asparagus succumbed to temptation by playing too much basketball in a dangerous place, which was brought about by the notorious Bad Apple. LarryBoy is trying to recover people from falling into temptation, and ultimately thwart the Bad Apple from her plan. The storyline of this game kind of parallels the PlayStation 2 game of the same name, though this one is greatly simplified. This game is a 2D puzzle/platform game where you try to reach the green goal at the end of each stage. You are given a certain time limit to accomplish this task, which varies depending on the difficulty level. You are also given the ability to jump, run + high jump, as well as interact with your environment in simple ways. You can climb up and down ladders, trigger switches to activate moving platforms, press buttons to solidify all blocks of a certain color, and get a key of a certain color to allow passage through lock blocks of the same color. You can also fly for a short while if you press B while standing on a fan. There are five worlds to play in, as well as two Larry songs. Each world has between six and eight levels in them, with the last level being a boss-like stage which usually involves a mini-game or special stage. Mini-games go from a stage resembling Donkey Kong to a Breakout-like mini-game to a Pong clone. There are two other ones as well. Each level is usually passable within two minutes, with many being passable under one minute. This unfortunately leads to an incredibly short game that I completed in less than two hours (I am being generous), with a good player being able to complete it in under thirty minutes. The graphics in this game fairly simple. LarryBoy is a simple sprite that, while identifiable as LarryBoy, is fairly simple and straight forward. The enemies for the most part are often-repeatedly used Onions, Peppers, or Peas, and of course the Bad Apple. Everyone is animated enough to get by, but nothing all that good. Some could probably use more frames or at least more variety. The fonts are also the smallest I have seen on the Game Boy Advance, and it would have helped if they could have used the next size up for most of the smaller text. How is the Sound and Music? This is another area where this game does poorly. The music, which is something that\’s a hallmark of VeggieTales, is treated to fairly simple MIDI-style renditions. I know that the Game Boy Advance has limited hardware, but the Larry Song levels were truly disappointing. They could have had some fun with it and done something original. Instead, your character hits a few notes in a Simon-like way (you repeat after the notes are shown to you). Some of the levels had MIDI tunes that did somewhat resemble Silly Songs I have heard in the videos, though they really could have added more MIDI layers if they wanted to. I just wish it was something more there. The sound effects are passable. This game does quite well here, understandably. There is no violence whatsoever, so this game is appropriate for even the youngest kids, and considering the difficulty level and length, it is probably intended for them. It tries to pass along decent moral lessons as well, and parts of the conversation have hints of Larry\’s wittiness.